Ticks, biting flies, mosquitoes be warned: this mom’s in no mood for shenanigans. From our first camping trips with our firstborn–and when we soon after hauled her off to southeast Asia at 7 months old, right up to our recent travels in Costa Rica with our third toddler in tow, I know that finding a DEET-free mosquito repellent that’s safe to use on babies and young children remains as important an issue for those of us taking the kids on a hike in the tick-riddled hills near home as for those heading off to camp at the lake–or hike near the big volcano. 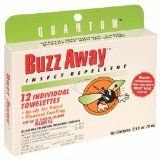 For our Costa Rica trip, their individually wrapped Quantum Buzz Away Extreme “wipes” were perfect for slipping into the side pocket of my daypack to have along in case needed during hikes–without adding the weight of a bottle of insect repellent (it was usually daypack + water, or toddler, or all three). It was also nice to be able to pack some mosquito repellent I knew would neither leak in our suitcase during any of five flights. What I found I liked best about them was the very liberal coverage they seemed to provide on my toddlers limbs, cheeks, forehead… without any spray to get into the eyes. And all without the weight of an extra tube of repellent lotion that would last the entire trip. When I saw there is also a glorious family-size pop-up canister of these wipes available, I couldn’t help but think this is the perfect centerpiece for our picnic table the next time we camp in Yosemite Valley in early summer. 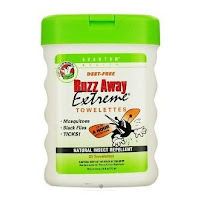 While that’s not where we’re headed this camping trip, some remaining Buzz Away Extreme wipes are already in my backpack. For those who are interested, I cover the topic of “Managing Mosquitoes” in detail in Travels with Baby, including important considerations about malaria and young children and the use of anti-malarial drugs in both children and breastfeeding women. You’ll also find tips on finding less risky zones for travel and finding fewer mosquitoes altogether, plus more DEET-free ways to protect your baby from mosquito-borne illness during travel. * In case you’re wondering, I’ve paid for all my insect repellents (and there have been many) out of my own pocket. As always, my opinions remain my own. And as always, use products according to the manufacturer’s instructions and with a healthy dose of common sense.